Tray sealing machines for sealing trays and clamshell packaging. Dual shuttle available for tray sealing machine. Also we have rotary style tray sealing machines for high production. 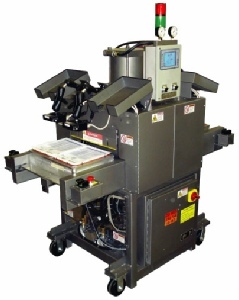 Up to two operators can independently monitor their own production on this tray sealing machine. These ray sealing machine are typically used for the production of finished medical device packages utilizing PET/PVC or similar type thermoformed trays with Tyvek lid stock for the medical Industry Tray sealing machine is made is USA..
• Precision double acting seal cylinders plumbed to a coalescing exhaust filter or special plumbing for outside exhaust.